Looking for sweet and appetizing ideas for Valentine's Day? 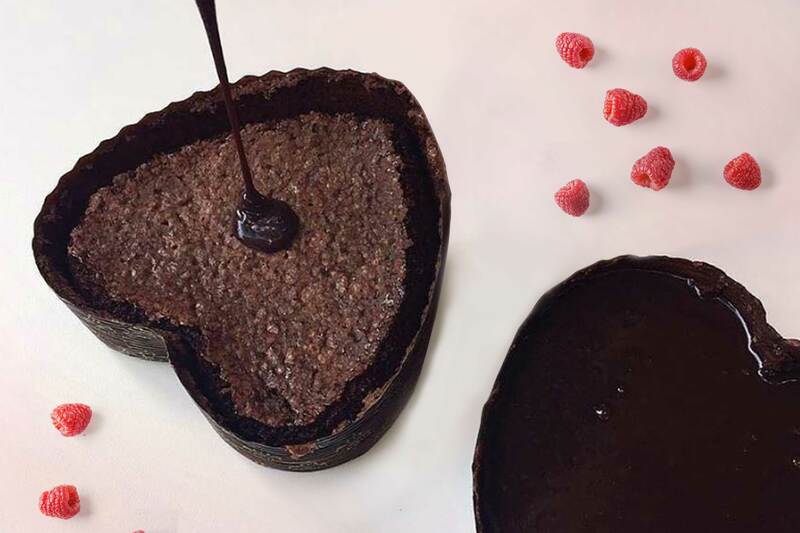 We offer a delicious version of the heart-shaped chocolate Italian Caprese cake, using the special Novacart Heart baking mold. The Caprese cake is a dessert originally from Capri made with almonds and chocolate, a delicacy that is easy to prepare and surely successful. To prepare the heart-shaped Caprese cake for Valentine's Day start by breaking the chocolate as finely as possible so as to facilitate its melting. Then melt it in the microwave or bain-marie in a saucepan. Once ready, leave it to rest to cool. Then mix salt, sugar and butter in the planetary bowl and create a homogeneous mixture with the electric mixer. With the whips in operation, add one at a time the eggs, melted chocolate and almond flour, always checking that the previous ingredient has blended well with the dough. When you have obtained a homogeneous mixture pour it directly into the heart mold, which does not need to be buttered. In fact, Novacart baking shape maintains the edges and defines the contours of the cake with perfect release even without buttering. When pouring the dough into the mold, be careful not to fill it completely but to leave about 2 cm of the edge, because during cooking the cake could swell and come out of the mold. Once all the mixture has been poured, level it with the back of the spoon. Insert the cake in a preheated oven at 170 degrees and cook for 45 minutes. In the meantime, prepare the ganache, the chocolate cream that will serve as a topping of the Caprese cake. Even in this case, break the chocolate bar into very fine blocks and heat the cream in a saucepan. Once it is boiling, add the sugar. Add the little pieces of chocolate and mix with a whisk until you get a smooth and liquid cream, then leave it all to rest for about ten minutes. Once the cake is extracted from the oven, let it rest for a few minutes and pour the ganache on the surface of the cake until it is completely covered. Leave the cake to rest in the fridge for at least three hours, after which your Valentine's dessert will be ready to be served! And if you do not like dark chocolate, you can replace it with milk chocolate. For the preparation of this cake you can use the special Novacart MCU0 heart-shaped baking mold in microwave-resistant cellulose paper that can withstand both freezing and baking up to 220 ° C.
This baking mold does not need to be buttered before use and thanks to the particular self-supporting structure it doesn't need to be inserted into preformed metal molds.